Imagine the most perfect vanilla ice cream. Now layer it with a rich fudge sauce. Then mix in chocolate covered peanuts. Now stop imagining and go make this Tin Roof ice cream. Right.Now. For someone who loves nothing more than the sweet symphony of flavors that the combination of chocolate and peanuts mixed together provide, this is the ultimate treat. The traditional Tin Roof Sundae consists of vanilla ice cream topped with Spanish peanuts and chocolate sauce, and this ice cream mimics the old-fashioned sundae perfectly. The combination of sweet ice cream and fudge sauce with the saltiness of the peanuts is wonderful. Note that the recipe calls for unsalted peanuts, but I love the sweet/salty combo so I went for the salted peanuts, and am so glad I did – I love the contrasting flavor that they provide. This recipe, although consisting of three components, is really simple to put together. The milk and vanilla bean mixture steeps for 30 minutes and in that that time I was able to make both the chocolate-covered peanuts and fudge ripple. Super easy! I made David Lebovitz’s Philadelphia-style vanilla ice cream (no eggs) back in the winter and thought it was fabulous, but the vanilla ice cream in this recipe… WOW. Quite possibly the best vanilla I have ever tasted. I think I said that about the chocolate ice cream last week to, but both are so true! It took quite a bit of restraint not to just dive in to the freezer bowl with a spoon when it was done churning. I did, however, make sure the dasher was clean before going into the sink! Oh, and those chocolate-covered peanuts? Totally addicting as well. Needless to say, this is a must try. It has to be – it’s on the cover of the book! So far I have celebrated July being National Ice Cream Month with Pistachio Gelato, Chocolate Ice Cream, and now the Tin Roof Ice Cream. As promised, I’m bringing you a new ice cream recipe each Friday during July and we still have two remaining! So tell me… what types of ice cream would you like to see featured here in the last two weeks? 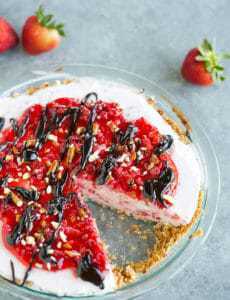 Any favorite flavors, add-ins, recipes? I have entered this ice cream in the Ice Cream Social Challenge being hosted by ScottySnacks, SavortheThyme and Tangled Noodle. If you’ve made ice cream this month head on over and take part in the social to celebrate National Ice Cream Month! Imagine the most perfect vanilla ice cream. Now layer it with a rich fudge sauce. Then mix in chocolate covered peanuts. 1. Warm the milk, sugar, salt and ½ cup of the cream in a medium saucepan. With a sharp paring knife, scrape the flavorful seeds from the vanilla bean and add them, along with the pod, to the hot milk mixture. Cover, remove from the heat, and let steep at room temperature for 30 minutes. 2. Rewarm the vanilla-infused mixture. Pour the remaining 1 cup cream into a large bowl and set a mesh strainer on top. In a separate medium bowl, whisk together the egg yolks. Slowly pour the warm mixture into the egg yolks, whisking constantly, then scrape the warmed egg yolks back into the saucepan. 3. Stir the mixture constantly over medium heat with a heatproof spatula, scraping the bottom as you stir, until the mixture thickens and coats the spatula. Pour the custard through the strainer and stir it into the cream to cool. Remove the vanilla bean, wipe it clean of any egg bits, and add it back to the custard. Stir in the vanilla and stir until cool over an ice bath. Chill thoroughly in the refrigerator. 4. When ready to churn the ice cream, remove the vanilla bean (it can be rinsed and reused). Freeze the ice cream in your ice cream maker according to the manufacturer's instructions. 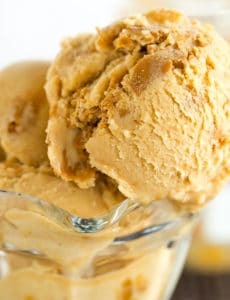 While the ice cream is freezing, chop the peanuts into bite-sized peanuts. 5. 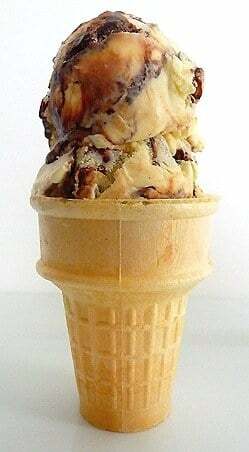 Fold the peanut pieces into the frozen ice cream as you remove it from the machine, and layer it with Fudge Ripple. 1. To make the Chocolate-Covered Peanuts: Put the pieces of chocolate in an absolutely dry heatproof bowl. Set the bowl over a saucepan of simmering water to melt the chocolate, stirring until smooth. In the meantime, stretch a piece of plastic wrap over a dinner plate. 2. Once the chocolate is melted, remove it from the heat and stir in the peanuts, coating them with the chocolate. Spread the mixture on the plastic-lined plate and chill. 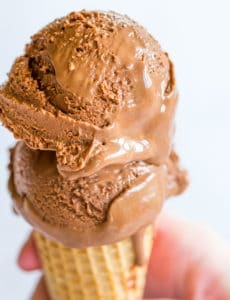 Mixing them in: Use a chef's knife to chop the chocolate-covered block of peanuts into bite-sized pieces, then mix them into 1 quart of ice cream as you remove it from the machine. Storage: Chocolate-Covered Peanuts can be stored for several months in an air-tight container, refrigerated at room temperature. 1. Whisk together the sugar, corn syrup, water, and cocoa powder in a medium saucepan. Heat over medium heat, whisking constantly, until the mixture begins to bubble at the edges. Mixing it in: The Fudge Ripple should be thoroughly chilled, as it's easiest to use when very cold. Just before you remove the ice cream from the machine, spoon some of the Fudge Ripple onto the bottom of the storage container. 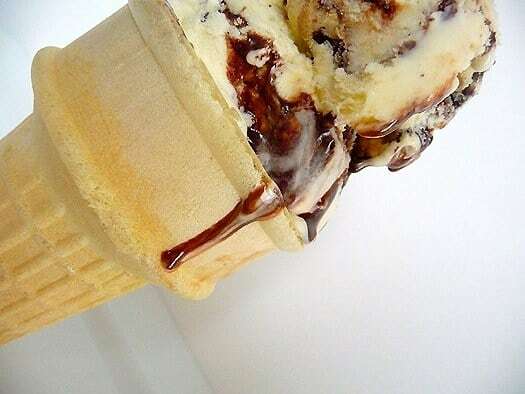 As you remove the ice cream from the machine, layer generous spoonfuls of the sauce between layers of ice cream. Avoid stirring the Fudge Ripple, as it will make the ice cream muddy looking. Storage: Fudge Ripple can be stored for up to 2 weeks, covered, in the refrigerator. 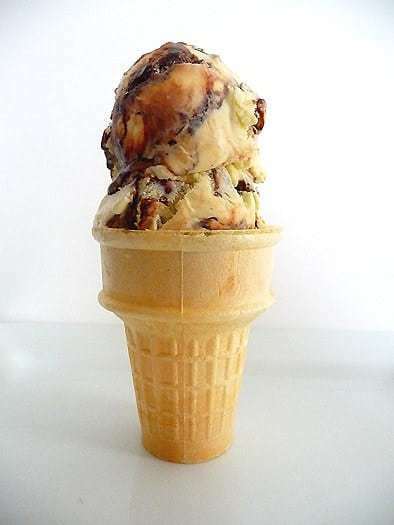 Our all-time favorite ice cream that we would LOVE to have a recipe for is German Chocolate from a chain ice cream store. 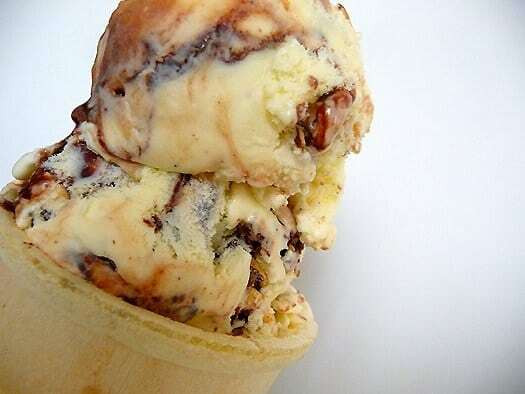 It is a chocolate ice cream that is packed with pecans and coconut goodness. This ice cream is absolutely delicious! So rich, creamy and easy to make. There are a number of steps to get it from start to the freezer, but the effort is so worth it. The fudge sauce is our new favourite ice cream topper. My 10 year old daughter asked why I haven’t always been making our own fudge sauce?! I scale the cocoa powder back to 5 tablespoons; just a personal taste preference. Sometimes I just throw the peanuts in sans chocolate coating if I’m running short on time or chocolate. It tastes like a DQ Peanut Buster Parfait that way! Thanks for sharing this Michelle.